Many Australians are dismayed with our acceptance of the national treatment of people seeking asylum, in a chain which is designed to be endless and painful and cruel, and succeeds amply. To what extent are we complicit? My perspective comes from sustained contact throughout life with many links in the chain, having worked for over 40 years in a range of levels, roles and agencies with refugees, migrants and people seeking asylum. Having a sense of something as right or wrong, good or bad, is the essence of humanity. We get it from home, from education, religion, friends, the media. It's the sniff test or the pub test or the gut feeling or the Bible or Quran or Torah. It might arise slowly, that itching nagging feeling that something is not quite right. Or it might come suddenly as a revelation, a flash of troubled insight. We all have it. Just as people have a sense of right and wrong, we also have a very good humbug detector, and it's clanging loudly when politicians unctuously claim all their 'stop the boats' strategies are driven by desire to prevent drownings at sea. The chain of complicity starts at our sea border. A boat enters Australian waters, carrying people seeking asylum — men, women and children. Perhaps it makes it to a remote Australian island or the mainland, which now happens rarely. In the past, naval vessels may have intercepted it, rescued the people, taken them ashore. It was naval officers who tried hard but unsuccessfully at the time of the Tampa to present the truth about children overboard — that it just didn't happen. Some of them doubted the ethics of what they were being commanded to do or to keep silent about it. These days, since the election-driven distortions of Howard and Beazley on the Tampa, and all subsequent governments, we see Border Force boats with their sullen determination of turnbacks, or detention on a naval boat at sea. "If the price of preserving business is silence or acquiescence, or active perpetuation of a system that is at odds with personal and organisational values, the compelling issue is why they should be involved at all. " If a boat isn't sent back, what next? 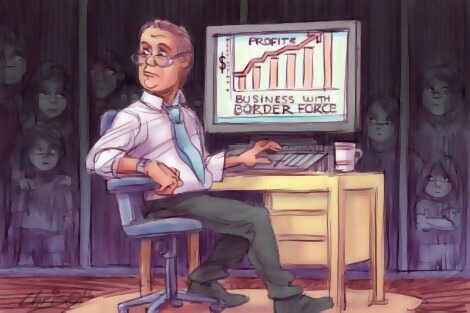 Border Force may put them on planes to Nauru or Manus, where contractors such as Ferrovial (Broadspectrum) and IHMS employ many subcontractors and staff — case workers, catering, security, recreation, interpreters, doctors, nurses. Most are positively disposed towards asylum seekers, and wish to alleviate the misery of their existence. But a job is a job, and the pay is good. All too easily a disconnect can occur between positive motivations and cruel realities. This allows organisations and individuals to continue their work with the sense that, on balance, their participation is beneficial. Or are they simply perpetuating an iniquitous system? Ferrovial has stated its intention not to seek a contract renewal from the government when it expires, saying detention is not its core business. Other organisations have made similar decisions, or are under pressure to do so — the major superannuation fund HESTA divested itself of all shares in Transfield last year, worth about $18 million. The No Business in Abuse campaign may in time bear more fruit. Contracted providers are often charities or not for profits. In Victoria the main providers are Red Cross, AMES and Life Without Barriers, all of them honourable organisations. A key driver for their involvement in the chain is the belief that they provide more and better staff, with better motivation and systems, and without the profit drive. They are probably right in this view. It was certainly the case for me and the organisation in which I worked for most of my life, and for which I retain huge respect. But good intentions can all too easily be compromised in a system that is essentially and purposefully cruel, and come at the price of giving a sense of respectability to an inherently cruel system. In the process they diminish their own reputation. I remember a few years back making a phone call at work about a routine matter to another organisation in the chain, a charity without government funding. I received the oblique message that my organisation was part of the problem, not the solution. At the time I was indignant. Now I understand that view. There are two further issues with the involvement of contracted providers. One is that the funding available for the so called legacy caseload is so meagre as to effectively strip their role of any beneficial support function. For single adult clients (the majority), staff can do little more than contact them a few times a year to check their address and their compliance, and make a few perfunctory enquiries about their wellbeing. Why are they involved in this at all? Staff want to do more, but can't due to the size of their caseload, and/or contractual arrangements. The second issue is to do with the business imperative. The whole chain is in fact a giant industry, created by governments. While the profit motive may not apply to all agencies involved, a sense of preservation or expansion of business and jobs certainly does, powerfully. My sense is that not-for-profits are no less driven by this imperative than for-profits. What conflicts their decision making immensely is that some providers are heavily dependent on federal funding for a range of programs through various departments, usually won via tender. For organisations that privately or publicly express ethical disquiet, departments can imply consequences. Or they can just bully. It can generate subservience and obsequiousness towards the department involved, and I've done it myself. "And then there is the final component of the chain. Me. You. The people around us. The nation. Like it or not, we are all in the chain, and share a collective responsibility for a system that operates in the nation's name, going back to the Keating Government's introduction of mandatory detention in the 1990s." A provider's abiding fear is that come next tender round they may happen to lose contracts, a catastrophic outcome for some. But if the price of preserving business is at best silence or acquiescence, or at worst active perpetuation of a system that is profoundly at odds with personal and organisational values, and the fair go values of the country, the compelling issue is why they should be involved at all. The Salvation Army faced this dilemma acutely through its role in Nauru and Manus. The mainstay of the system is the Department of Immigration and Border Protection acting under instructions from its minister. Can its staff members express any concerns, without fear? Do any consider that they cannot, in conscience, work in that department? In a climate where frank and fearless advice is no longer welcomed by Government, such open expression is less common. And then there is the final component of the chain. Me. You. The people around us. The nation. Like it or not, we are all in the chain, and share a collective responsibility for a system that operates in the nation's name, going back to the Keating Government's introduction of mandatory detention in the 1990s. We have regularly voted for politicians and governments that treat others in ways that we would not wish to be treated ourselves. Here are some questions we can ask ourselves. Am I aiding and abetting the system, while supporting detainees? Am I doing anything at all to contribute to the end of the system? Am I regularly speaking up within the system about the wrongs I see or perceive? Should I feel bound by confidentiality or secrecy provisions of my contract (personal or organisational), when I know what I am seeing or being asked to do is wrong? Are my job and pay persuading me to overlook things? Do I want to work in an organisation that stays in or is trapped in the chain? In the case of businesses (both for and not-for profit), to what extent is involvement driven by business expansion, or protection of other business activity? In the case of governing boards or councils in not-for-profits, are their defined or perceived responsibilities too heavily weighted towards business, and insufficiently towards ethical considerations about people seeking asylum? Should I do anything to expose or oppose the system, and suffer the consequences — court martial, criminal charges, loss of job, reputational damage? As a politician in a party that supports the whole system, is it time for me to get out? If we ever have a royal commission or similar in Australia, how would I come out of it? As a member of the electorate in a democracy, what can I do? There seems little point in getting right out of the system quietly — we should say why, publicly. As Australians involved in this chain of complicity we need to reflect on our own motivation and role, and make some important decisions about how to respond. Treating people seeking asylum as we do is akin to other great wrongs of Australian history — Indigenous displacement and deaths, stolen children, White Australia, child migration programs, sexual abuse of children. Each is different in scale and nature and impact, yet each one adds to our conviction that we can do better, much better. Rod Grant worked for nearly 40 years in programs for migrants, refugees and asylum seekers, mostly in senior management positions. He volunteers with two asylum seeker support groups in Melbourne, Hobsons Bay Refugee Network, and West Welcome Wagon. The author acknowledges editing assistance generously given by Tess Altman. Thank you Rod. You've said it so plainly and well. There is a well deep inside that is troubled by this, and it will continue while I, as an Aussie, have to own this continuing injustice. Rod Grant, thank you. Yes, we are all involved. We all do things that support bad systems and we can all reflect on those things and do other things instead. Once I worked in an organisation whose aim was to help people with certain problems in life, and after the first flush of enthusiasm, I realised I was in a cult. It took me some time to extricate myself and many years to free my mind and soul. How can we, as individuals and as a community of citizens, free ourselves of this cult that denigrates, suspects, oppresses, imprisons anyone seen as The Other? It is a cult whose origins stretch back to 1788 and beyond. This is not a simple matter. It is helpful to have your honest words. Great article Rod. Thanks. When we start asking questions like this and thinking, someone in the system somewhere will start to quash it... it doesn't want us to think independently. So.. keep the challenges coming. Thank you, Rod, for your thoughtful article and soul-searching questions. We are woven into this social fabric of self-protection and complicity through fear for our own wellbeing. Picking apart the threads that bind us, which you name very well, calls for courage and solidarity. Waking up to these threads and strings is a part of our growing discontented with how things are, and voicing defiance towards the status quo. Thank you Rod, for alerting me to the iniquitous system imposed by my Federal Government. I look for shared mourning and grief amongst concerned citizens. Our complicity can be transformed into outrageous activism. Thanks Rod. What also worries me is why there is no one in the Federal Parliament prepared to stand up and say that this is wrong and we should stop it. Don't any of them have a moral compass? Wonderful article, Rod, that exposes the "post-truth" realities and all the modern methods of influencing behaviours and opinion on this, both within the relevant organisations and in the public forum. And it asks all the right moral questions. If only it were reprinted in a national newspaper and by other media entities, which would spread the questions and observations further. Good artiie!!! How is the institutional Catholic Church standing up publicly against the evils perpetuated against asylum seekers? How hard it is (in my parish) to even say the word...refugee... much less motivate us to follow Christ by fighting this injustice It is appalling!!! We become partners in an inhumane action. What is wrong with some of our Parish priests.The Bishops have. Condemned the situation, and even that does not challenge them into any sort of action. The power of the Parish priest is shackling the church. The church needs to "empower" us, not deny us our freedom.! Bravo Rod, an excellent piece to stir the hearts of those who read Eureka Street. This type of thought -provoking journalism needs to be on the front pages of daily newspapers. I cant imagine how our leaders can sleep at night. The United Nations has dammed the Australian detention camps as cruelest in existence. Our government is only interested in its own agenda, to stop the people traffickers, the fact that the boats contain traumatized persons lies outside their agenda. They fail to recognize that each boat person is somebody's son or daughter, they have sacred dignity as human beings with vulnerable 'souls'. The day will come when Australia will be held to account by other nations! Well said. When you start to think about complicity.... you realise, that the detention system created a massive web. It had to, to survive. That web has caught up many good people and good organisations. The presence of detention, has damaged us widely. . Excellent, if discomforting. Which it should be. Thank you for a very honest assessment, which not many would be in a position to see for just what it is, so clearly. Thank you for saying it courageously, from your well-informed perspective. It _needs_ saying out loud intelligently, and often. Thank you Rod for your thoughtful essay. You speak as one deeply involved in what I call this execrable mess and I am interested in your views as expressed. I only hope others working within this appalling detention system will have the courage to speak out, as you have done! Thank you, Rod, for encouraging all of us people who busy our lives with people seeking a safe haven to confront the 'wicked problem' of actually aiding the ghastly system to survive while simultaneously giving succour to its victims. “Just as people have a sense of right and wrong, we also have a very good humbug detector, and it's clanging loudly when politicians unctuously claim all their 'stop the boats' strategies are driven by desire to prevent drownings at sea.” Europe is the (retrospective) reason why we have the blockade and the additional attempted deterrence of detention. Stopping drownings at sea are a happy coincidence of both but not the reason for them. Detention as a deterrence is employed because Europe is what happens when there is no blockade and no attempt at deterrence. Foreign detention isn’t immoral. The only difference between moral and immoral detention is the material living conditions within the facilities. A better reason against overseas detention is to avoid Australia becoming obligated to foreign powers. The humbug detector is for the overuse of the term ‘asylum seeker’. Irregular maritime arrivals to Australia and irregular maritime and land arrivals in Europe and the Americas are mainly not people seeking refuge against persecution. They are poor people migrating by hook or by crook to a safer economic future in, for obvious reasons, the West. That we are not using vocabulary about managing economic displacement is the humbug. Roy, I think you'll find the "poor" civilians suffering from malnutrition in Aleppo can quite rightly claim to be "persecuted". You could extend this to many other parts of the world where poverty and persecution go hand in hand and can't be neatly separated into two distinct issues. "Forced migration" is a better way to describe what's happening rather than fall into political rhetoric that only demonises people in situations we in Australia could never fathom how we'd survive. Aurelio: “you'll find the "poor" civilians suffering from malnutrition in Aleppo can quite rightly claim to be "persecuted". You could extend this to many other parts of the world where poverty and persecution go hand in hand and can't be neatly separated into two distinct issues. "Forced migration" is a better way to describe what's happening rather than fall into political rhetoric that only demonises people….” Can ants whose homes are trampled by two elephants focussed on their own struggle and indifferent to collateral damage claim to be ‘persecuted’ by the elephants? A persecution is a personal relationship between an oppressor and a target. That’s why earthquakes, tsunamis and volcanoes produce refugees but not asylum seekers. A problem can’t be fixed unless it is properly defined. You can’t fix the problem of people seeking by hook or by crook to leave decaying societies or economies if you insist on shoehorning them into the category of someone suffering from a personal tyranny by someone else. So the High Court finally has its first woman chief justice. Mainstream media have seized upon this as a remarkable achievement for the legal profession and as 'a fair go' for the empowered woman of 2016. Kiefel's attainment of her highest goal should be recognised as no such lesser win. It is right and proper recognition of the suitability of a solidly trained and experienced lawyer, and the product of this individual human being's commitment to the law and its customs, protocols and conventions. Earlier this year, a Queensland man was found not guilty of intentionally infecting his former girlfriend with HIV. The case was sent back to the District Court to determine a sentence for the lesser charge of grievous bodily harm. At the time of the decision, the not-guilty finding was both welcomed by advocates who see criminal prosecution as reflecting the stigma of the condition, and criticised by others who consider the criminal law an appropriate sanction for harm caused.